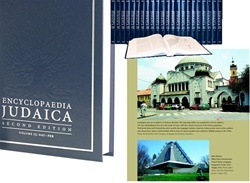 The landmark Encyclopaedia Judaica, lauded as the standard work on Judaism since first appearing in the early 1970s, has been extensively revised and expanded for this long-awaited new edition. Nothing compromised, included are more than 21,000 signed entries on Jewish life, culture, history and religion, written by Israeli, American and European subject specialists. Expanding the scope and relevance of this invaluable set are more than 2,600 brand-new entries, many focusing on gender issues and New World geographic areas of the United States, Canada and Latin America. Even more clarity and substance is incorporated through the updating of some 11,000 entries across all topics. The Holocaust segment alone features more than 50 entirely new articles. Scholars, general readers and students alike will use this 22-volume set. Extensive cross-referencing and large subject index are just two of the many features making this huge set easy to use. Quick references are also facilitated through place-name lists, a chronology, a Hasidism chart, lists of newspapers and periodicals. More than 600 maps, charts, tables, photographs, illustrations and other visuals concisely illustrate key textual elements, and among other features making this scholarly work accessible, are entry-specific bibliographies to help guide further research. Included in each volume is an 8-page full color insert that provides a rich and thematic illustration of the many aspects of Jewish life and culture, as well as a record of the physical development of the State of Israel.